We’ve procured another picture of some celebs rockin’ the still unreleased Air Jordan Retro 3’s in the Black/Cement Colorway. According to the Shoegame.com these babies don’t come out until Black Friday-November 25th. I’ve got some sort of obsession with these, but it may wear off a bit after seeing the new pictures below this writing. The black leather looks a bit hard, crinkly and uncomfortable. But last up close picture we saw, the leather was more Pebble looking not wrinkly, so who knows when they come out what kind of leather they’ll really have on them. 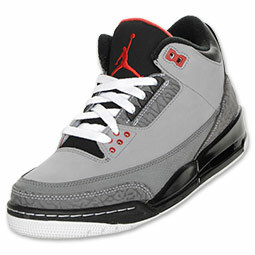 And actually the Stealth grey 3’s are available now on Finishline.com, so I might just cop them. Grey is one color I don’t have any shoes in any way. And I already have the Retro 3 Black Cats which are so all black that I can even get away with wearing them to work. But they are starting to fall apart a bit. Oh Decisions, Decisions. If I could get anything, I still really want the Jordan 11’s. If the Knicks don’t play that night, I will stand in line for them-Unless its super cold in NYC. Aaaaah! These do look pretty nice..eh? What You gonna cop this year? What do you think is the hottest release for 2011? Jordan, Dunks, or maybe even the Deadmau5 kicks that you can’t even order from the puma.uk.com on-line store unless you have a Mailing address somewhere in Europe..yeah..I did attempt it..I tried to get a pair..the day they came out… and even tried to think of a mailing address in England that I could try and send them to-but I didnt think the guy at the hotel I stayed at would remember me… He’d probably just end up with a new pair of kicks! Crinkly or pebble leather or maybe smooth by the time they come out? 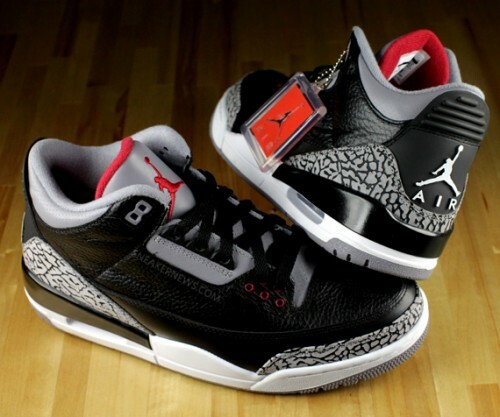 Here’s a picture of the Stealth Grey, Varsity Red, Black and White Air Jordan Retro 3’s available at this moment at finishline.com. Posted on September 6, 2011, in Celebrity Shoes, Jordans, KICKS, NYC, Streetwear, Streetz STYLE and tagged Air Jordan Retro 3's, Amber Rose, Black Friday, Celebrity Kicks, Deadmau5 Kicks, Jordanites, Kanye West, sneakerheads. Bookmark the permalink. Leave a comment.